Last year, the internet became aware that Sebastian Stan, who plays The Winter Soldier in the Marvel Cinematic Universe, looks a hell of a lot like a young Mark Hamill. Naturally, since Disney is making Star Wars movies for years to come, many started fan casting Stan as a young Luke Skywalker. Now, the actor has taken this from fan casting to reality, as he's declared that he'd be happy to play a young version of the most iconic Jedi ever. Sebastian Stan recently made an appearance at the Rhode Island Comic Con. During his panel, a fan asked a question regarding whether or not he'd be up to play Luke Skywalker in a Star Wars movie, should the opportunity ever arise. As it turns out, the actor would be "very happy" to do so. Here's what he had to say about it. "I just want to say here that anytime anyone would like to call me and ask me about Luke Skywalker, I'd be very happy." Many Star Wars fans might think something like this is borderline blasphemy, but it's probably not that far from a reality. In truth, it's probably closer to downright probable. Disney and Lucasfilm already have a great relationship with Sebastian Stan after working with him on the MCU movies. And, again, the similarities between the two are pretty uncanny. Also, let's not forget that a young Han Solo movie, officially titled Solo: A Star Wars Story, is coming out next year. If Disney and Lucasfilm can make us buy someone other than Harrison Ford as Han Solo, it's certainly possible to do so with Mark Hamill and Luke Skywalker. There's also so much to explore in a movie with a younger Luke Skywalker during the time of the original trilogy. Or, just after the events of Star Wars: Return of the Jedi. A version of Heir to the Empire, perhaps? Thrawn and Luke Skywalker in live-action? That's just a fan speculating, but the point is, there's a lot of room to run there. Mark Hamill has even noticed these similarities and has signed off on the idea. In his own, loving, silly and charming way. And, not for nothing, but they both have a metal arm in their respective franchises currently. 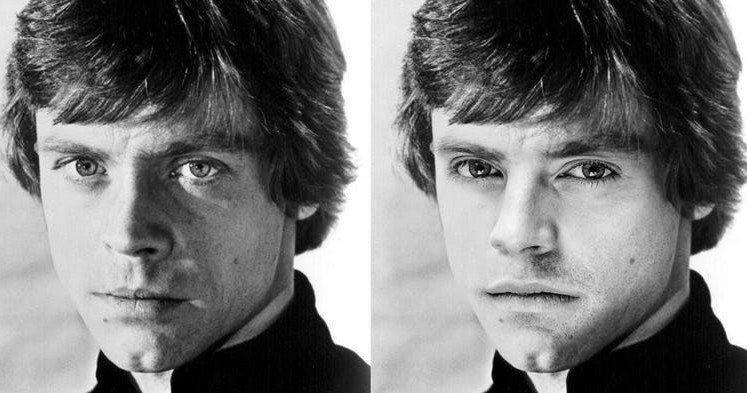 Taking to Twitter last year, Hamill posted a picture of them side-by-side and acknowledged the resemblance. "Sorry to disappoint you but I refuse to say 'Sebastian Stan-I AM YOUR FATHER!' (even though, in fact, I am) #SorryNotSorry #MySonSebastian"